Liat Yossifor’s recent monochromatic portraits shift politics into process, clashing the tradition of modernist color-field painting with a conceptual concern about identity and invisibility, the body, its place in history and conflict, and the true depth of surface. 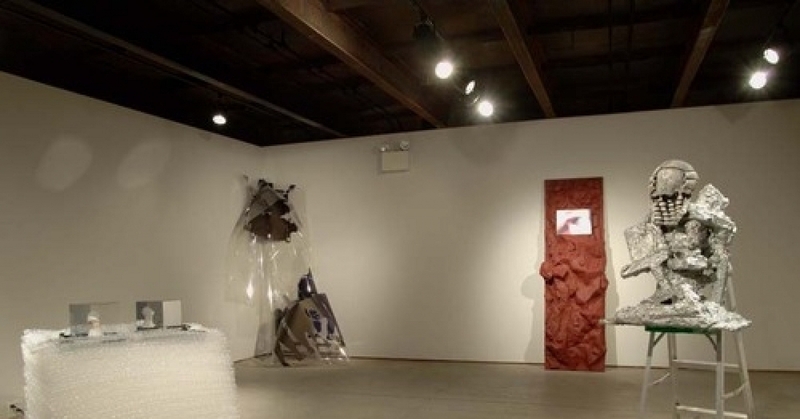 The work features images of women performing aggressive, confrontational stances. Most of the models are Israeli with an actual history of service in the armed forces. Like sisters or soul mates, sources of desire and conflict, these women are mirrors for Yossifor herself, who did not serve in the Israeli military due to the fact that she moved to the States as a young teenager. Together, painter and subject trace a diaspora of women through hypothetical subjects, which straddle the two extremes of engagement. Together, they imagine a community of women who confront the legacies of their bodily conscription to inherited causes while at the same time refusing the violence of their own representation. For the viewer, the subject of Yossifor’s work is mysterious; at first, the canvas appears, at an angle, as brushstrokes on a monochromatic surface. But, under a particular light, at just the right angle, the subject appears—slowly, magically or suddenly, depending on the trajectory of one’s approach. The palette of this series is serious, earthy and rich: Venetian reds and Mars brown, flesh tones, warm whites and lamp black. These are colors that refer primarily to the body—hair, skin, pupils, the inside of the mouth, as well as the abject and dissolving places beyond the surface of the skin. With the assistance of her models, Yossifor makes a new kind of self-portrait, engaging a process that is at once painterly and social. She uses the monochrome to tweak the viewer’s idea and perception of difference, to see what isn’t at first visibly there through contiguous and homophonic gestures. The stroke of the brush is the fall of the hair, the wrinkle in clothing composed by the very brush-fibers and the hard-edged lines are the shape of the defiant mouth, closed against opening, to create a surface on the brink of speech. The red attracts, but like a training manual, it holds information: it is coded, meant to be read. As critic Ann Eden Gibson has suggested, traditional monochromatic painting can be a rich site for thinking about “difference,” if the work is read against the grain of standard art historical interpretation. Rather than considering monochromes as some kind of pure materiality or metaphysics, she posits these works as telling “a history of attempts to escape the phallocentrism of language, the violence of representation and the control of bodies marked as different.” Yossifor’s program is similar: a subtle insistence on the plurality of her “grounds,” affecting a metaphysical crisis by paralleling the specifically female bodies pictured there with the conditions of their materiality in paint. Demanding, proud, engaged—the image reveals itself. Where at one moment very little can be seen, now the gaze is direct. But then the figure itself starts playing tricks on the eye. Between her body and her pose, where exactly is the figure of the woman? 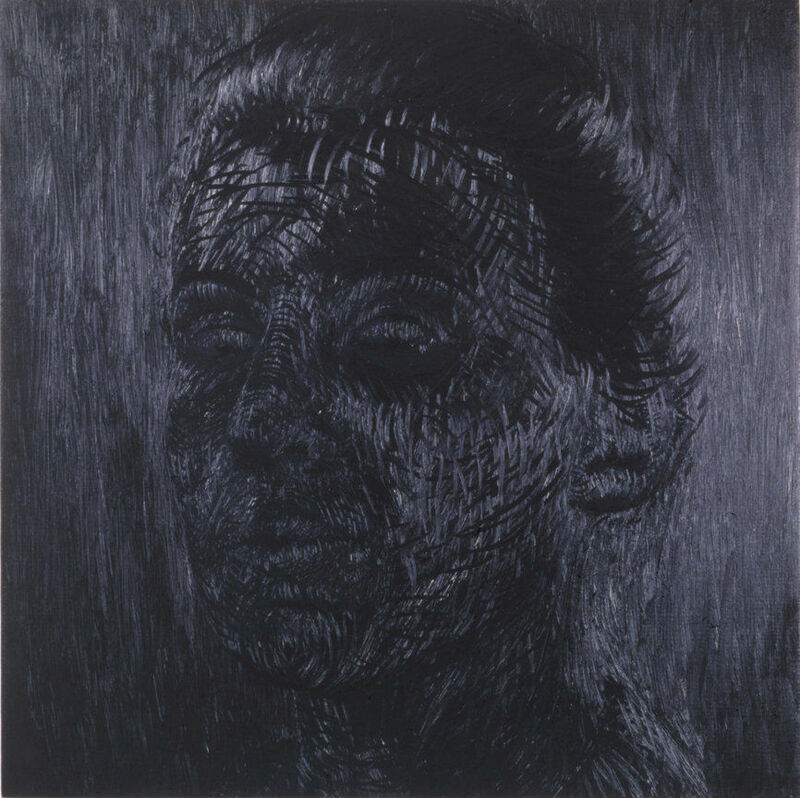 Between her body and the background, what is the differentiation between her image and the ground she came from, between “her” and her “motherland?” The works suggest the embedded nature of this particularly gendered “feminine” conflict, and at the same time, or perhaps as a result of such circumstance, the invisibility of this struggle. In Yossifor’s case, “painting” remains a verb intimately tied to this process of revelation. To see is the goal of her laborious work. Imagining and sketching each figure repeatedly in a series of meditative acts, Yossifor accumulates brush strokes on her monochromatic panels until the female figure is literally drawn out from an undifferentiated background. The working time for this process is only a few intensive days, a solitary act by the artist concentrating her will and her vision while her paint is still wet. The apotheosis of this activity—what Reinhardt, for example, considered to be the end of painting itself—are Yossifor’s black paintings. This is a focus of the body only reserved for such serious acts of training as the practice of the Zen master, the martyr, the spy on a reconnaissance mission. 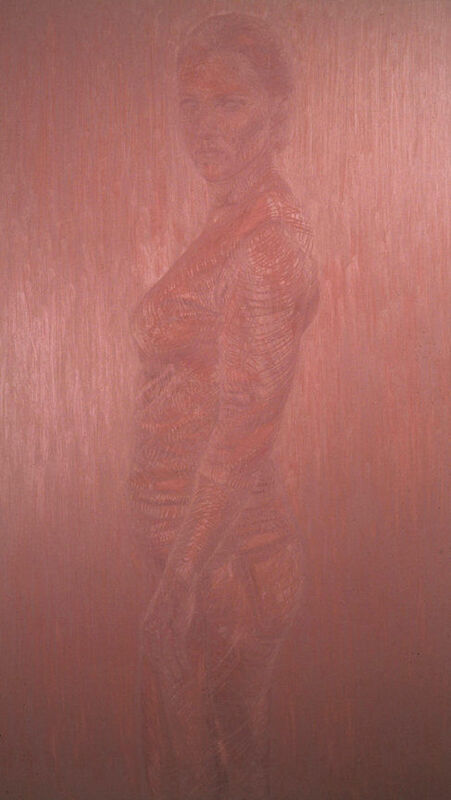 Here Yossifor works the material paint into a figure through known and repeated gestures. In the black pigment her hand must see what her eyes cannot. Every stroke disappears into the abyss. It is here, in the condition of a not knowing, that Yossifor finds her subject. Reversing and confronting the historically-loaded anti-Semitic idea of the “blind” Jew, who cannot “see” the “light of Christ”, Yossifor rescues and redeems a body marked abject, not just by material conditions but a belief system whose faith centers on eternal questioning, investigation and re-reading. Nothing is a given in the ancient Talmudic system, and from Nothing emanates everything. Because her subject matter appears only to the person who is willing to approach the painting, Yossifor’s phenomenological strategy makes the act of seeing it part of the rigor also required of her viewer. No longer a self-sufficient object, the meaning of the work is shifted outside the frame. The paintings exist only upon engagement: they train the viewer to contemplate their materiality as products of history, presenting a surface moment that only composes itself because it has been suspended in the varnish between presence and disappearance. 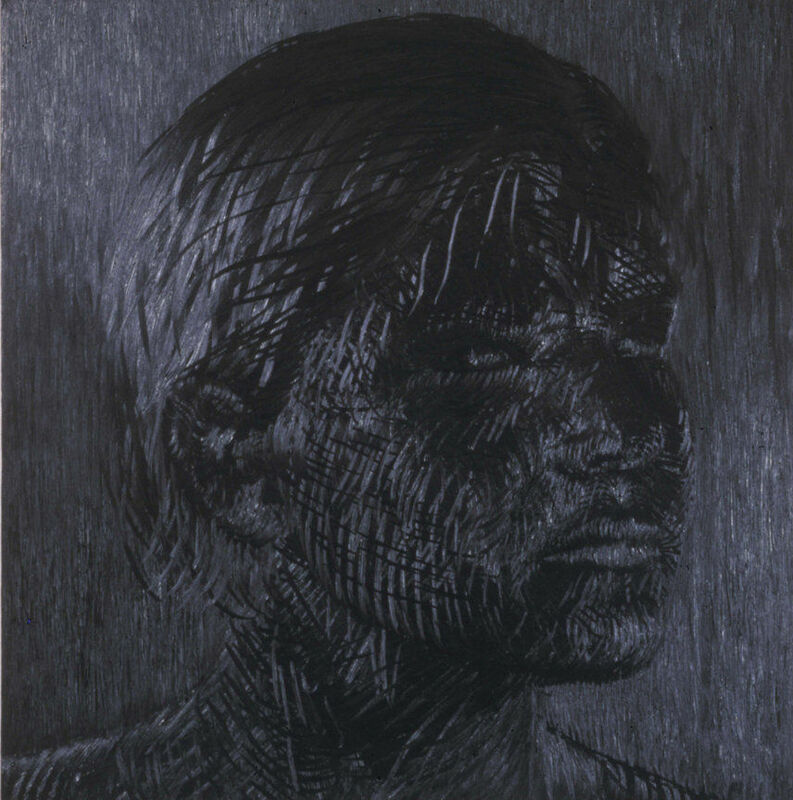 The instant when the figure becomes visible, stepping out of the void in confrontation and recognition, marks the coincident moment where viewer and painter converge across time to overcome a unique and momentary blindness.